Every day our youth lay down their lives. Every day the monster of violence and destruction, wreak havoc in the valley of flowers. Every day devil enters paradise to commit sins. Every day we carry the bullet-ridden bodies of our budding flowers and bury them, express anguish and shed tears. We mourn, and then there is a sort of truce and then we start once again and the whole cycle continues. That is Kashmir for you. Bleeding, crying for peace, and awaiting the promises made to it. There are various narratives with regard to Kashmir: The narrative of Indian and Pakistani government, respective civil society of both the countries and the narrative of world community etc. All buzzing around, heard, discussed and finding a place at world forms, seminars, convocation and in media. We, who live the Conflict, too have a narrative, which however finds less sympathetic ears. Our narrative is, both ignored and accused of being barrowed or sponsored from outside. Our voice finds barricades on earth, under water and even in air. Simply, we feel chocked. The problem is, that world seems confused about us or plays ignorance. However, we do not want anything unacceptable out of blue. We simply deserve, what was promised to us and that is plebiscite. No one can take away our right to self-determination. We have no love for alienation or hatred towards social integration. We simply want peace, conflict resolution, respect for our property, lives, dignity, a space of freedom, for us, in our own land. That is no sin, off course. What shocks us is that, those who experienced the wrath of colonialism on themselves should not have indulged in colonial acts. Those who once supported the freedom movements of many countries, like Bangladesh and South Africa etc should not have muted a similar voice in Kashmir. Those who once led non-align movement now have aligned themselves in such a way that the entire south Asia rests on a nuclear volcano with the trigger in Kashmir. Those who once stood for human rights now carry the acquisitions of human rights violations in Kashmir. Those who once propagated nonviolence and “Satyagraha” have adopted the policy of ruling with iron hand in Kashmir. You tell them reality, and with one stroke of “nationalism” “unity and integrity”, “soldier and boarders”, they will put an end to all your arguments, forgetting that their own preamble aims to secure to all its citizens justice, liberty and equality too, even if we set aside historical context of Kashmir, instrument of accession and the promise of plebiscite. Regarding the world community, why should they make any efforts to resolve world conflicts including Kashmir, when that is what keeps their economy going. Those economists of conflict and violence manufacture wars, if their arms business seems going down. With conflict of Palestine, Middle East, Afghanistan, Rohingiya crises etc finding no solution, what hope we should keep from such civilized world? UN has not jus failed us but also the whole world. People in both India and Pakistan need to wake up from deep coma. They need to know that their tax money is being used for all kinds of evils. They need to know that resolution of Kashmir conflict is for their own betterment and for the good of humanity at large. They need to know that the conflict is probably been kept alive by a third party which looks at Kashmir conflict as a business opportunity only. 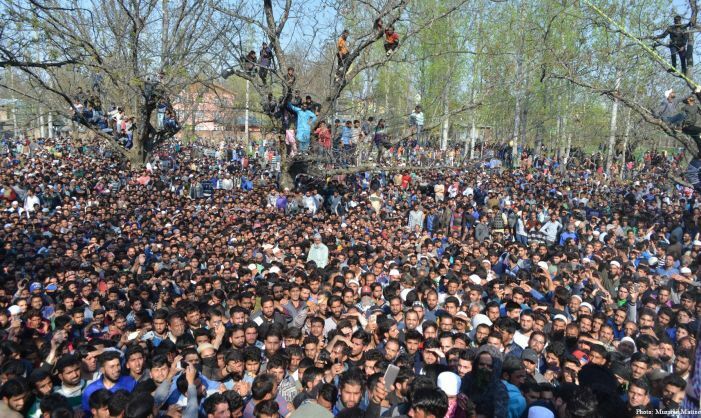 Let they be shuddered by bitter truth, that, for politicians in India and Pakistan, Kashmir is an issue of election campaign. For Armies of both the countries, it is a place to play games and be like unbridled horses. For arms companies, it is a business hub. However, for us it is our paradise, turned into a living hell. Truth, even though twisted by knaves to make trap for fools, stands clear: We deserve and want to live in peace, with freedom and dignity. Imran Khan, M.Phil in Psychology, Presently working a Teacher in School Education Department.